Status: Rare regular spring migrant southeast, rare casual elsewhere. Rare regular summer visitor southeast and southcentral, rare casual elsewhere. Rare casual breeder southeast. Rare casual fall visitor (after Aug) statewide. Documentation: Specimen: HMM 28539, 17 May 1956 Hastings, Adams Co.
Taxonomy: Five subspecies are recognized (Gill and Donsker 2017), one of which, violacea, occurs in North America; three others occur from Mexico to Brazil, including Socorro Island, and there is an endemic form on the Galapagos Islands. Nebraska birds are violacea. There is an earlier date 2 Apr 1977 Douglas-Sarpy Cos. Arrival dates are generally in the first third of May; spring records are probably of overshoot spring migrants, as Nebraska is north and west of the breeding range. As might be expected, there are only two Panhandle reports: 7-25 May 1969 Dawes Co, and 20 May 1991 Scotts Bluff Co. Northerly reports are few also: a specimen, UNSM ZM17043, collected southwest of Ainsworth, Brown Co 14 Apr 1992 (Brogie 1997), one at Broken Bow SL, Custer Co 7 May 2014, an adult in Knox Co 27 May 1986, and an immature in Creighton, Knox Co 9 Jun 2004 (Brogie 2005). Summer: The only confirmed record of breeding is of a nest in Fontenelle Forest, Sarpy Co 4 May 1963 which was later abandoned; birds had been in the area for three years prior (Sharpe 1964). That this is the only confirmed record of breeding is surprising in that the species is a regular breeder as close as northwest Missouri and northeast Kansas (Mark Robbins, pers. comm.). A partial explanation might be that this species tends to be a solitary nester in rather inaccessible habitats. These nearby non-Nebraska breeding birds may be the source of dispersing juveniles at dates early enough to be suggestive of local breeding. The two reports are of a “fairly young” bird at Fontenelle Forest 29 May 2006 where an adult had been seen previously, and a recently-fledged juvenile found on 18 Jun 1980 in northern Lancaster Co that had down feathers on the body and incompletely emerged primaries (Ducey 1980). One near St Deroin, Indian Cave SP, Nemaha Co 14 Jun 2017 may have been breeding. There are about 47 reports in the period mid-Jun through mid-Jul; most are northward dispersing juveniles in the Rainwater Basin and southeast. This species staged a mini-invasion in late Jul-early Aug 2012; Jack Sinn WMA, Saunders and Lancaster Cos hosted 1-4 from 16 Jul (two juveniles) through 29 Jul (three juveniles) and 17 Aug (1-2 juveniles) along with an adult 18-24 Jul. During this 2012 invasion, there were three northerly reports, only the 2nd-4th such reports: an immature in Antelope Co 23-26 Jul, a county first for the veteran observer, an immature in Dodge Co 25 Jul-4 Aug, and an adult and two juveniles in South Sioux City, Dakota Co 27 Jul-16 Aug. These northerly sightings appeared to be of birds undergoing normal late summer dispersal, but overflying dried up wetlands in their search for water. The only other previous northerly report is of a juvenile north of Crescent Lake NWR, Garden Co 27 Jun 2010. There are later reports 10 Oct 1979 Douglas-Sarpy Cos (Williams 1980), and 11 Oct 1998 at Glenvil WPA, Clay Co (Jorgensen 2012). There are only about 23 reports after Aug, indicating that there is no fall migration per se; rather, reports after Aug are lingering stragglers. The few Panhandle reports are as follows: 30 Jul-5 Aug 1980 Box Butte Reservoir, Dawes Co (Rosche 1982), 22 Aug 1991 Scotts Bluff Co, 27 Aug 2017 Alliance, Box Butte Co, 30 Aug 1996 Crescent Lake NWR, 20 Sep 2000 Box Butte Reservoir (Jorgensen 2002), and 4 Oct 1991 Scotts Bluff Co.
High counts: 9 near Hastings, Adams Co 19 Aug 2005, 6 at Harvard WPA, Clay Co 20-21 Jul 2013, and 5 at Heron WPA, York Co 2 Aug 2003 (Jorgensen 2012). 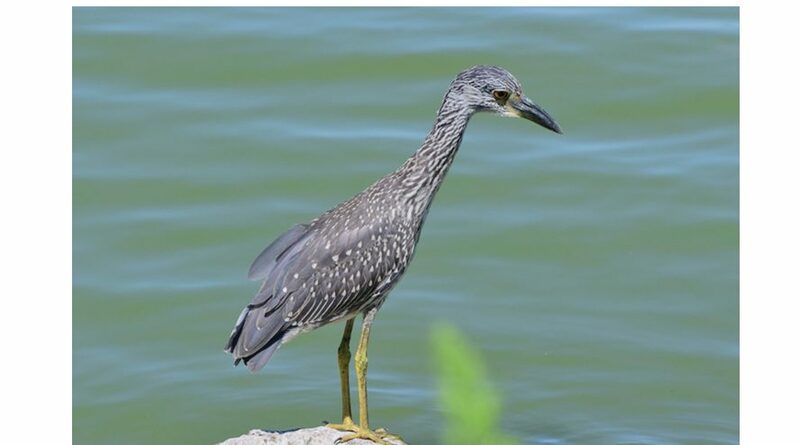 Photograph (top) of a Yellow-crowned Night-Heron at Holmes Lake, Lancaster Co 24 Jul 2018 by Steve Kruse. Ducey, J.E. 1980. Immature Yellow-crowned Night Herons. NBR 48: 87-88. Sharpe, R.S. 1964. Yellow-crowned Night Heron nesting in Nebraska. NBR 32: 9-11. Williams, F. 1980. Southern Great Plains Region. American Birds 34: 176-179.